Disclaimer: I haven’t read this book, despite the fact that I want to. I stumbled upon this title on (as usual) Bill Gates’ blog. 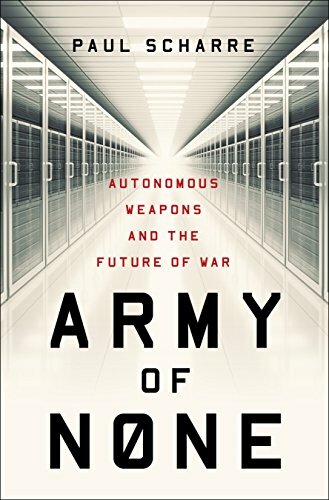 He picked up this book: Army of None: Autonomous Weapons and the Future of War by Paul Scharre as one of his favourites. Reading the synopsis then brings me back to a year ago, one of the most difficult time during my school year in University of Melbourne. In my third semester, I took one subject titled Impact of Digitisation which learn anything about effect of technology on daily life, be it on social life, marriage, work, health care even on crime! When the lecture assigned us to write an essay on whatever topic we like, I purposefully choose the impact of Artificial Intelligence on war. Decision that I regret. Why? Simply because I was too attached to the issue. The development of Autonomous Weapon Systems (AWS), although the technology does not exist yet, has raised the ethical and moral issues. These potential future weapons have garnered attention and invited debate amongst the high-profile leaders. Autonomous means that once activated, the system will perform a task on its own. This triggers the research questions whether and to what extent dehumanisation takes place in the process and what actions should be taken to prevent this from happening. Based on the analysis, the negative impacts outweigh the positive values. Therefore, support from society and strong policies are required. The key is: dehumanisation. During the writing process, I can’t stop thinking on how the advancement of autonomous weapon systems has shifted the weapon machine operation from automatic technology to autonomous. The journals, the book chapter, the videos all presented on how cruel human can be. Can you imagine on the real war, when we employ the autonomous weapon, it will perform no judgement on situation. The further the distance, the lesser psychological impact on the life-taker due the detachment of the actor from the consequences. Interestingly, the more I dislike the subject, the more it intrigues my curiosity on it. Thus, I put this title as the next-book-to-read.